I preached here today. Or rather my trans* Jesus did: Jesus The Queen Of Heaven. Preaching in this bastion of apparent straightness. Maybe I did it out of mischief. Certainly not the best place to communicate with people from. But it felt like a good place to stand in and rail against the fact that so many of us are forced into prostitution. A good place to declare my personal pride in embodying "this so-called shame and this disgrace". A good place in which to remind the congregation that Jesus never condemned gay or trans*people. The people he condemned were the self-righteous: "those who condemn others and imagine themselves good". And a good place, above all, to remind everyone that Jesus is Queer. "Always was. Always is. Always shall be. From now until the end of time". 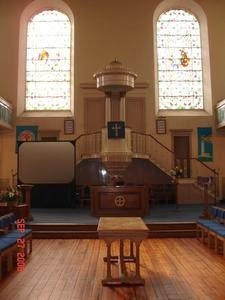 I was there, at Broughton St.Mary's in Edinburgh, in a time when certain other congregations in the Church of Scotland have decided that their hostility to homosexuality is the most important thing about their Christian faith. But this congregation and their minister are determined to affirm their commitment to ending discrimination: and they invited me to affirm with them. So I did the Queen Jesus sermon, and the story of the Prodigal Daughter, and blessed them all as part of their regular Sunday service. And the congregation were lovely. They all wanted to hold hands for the blessing; they made me so very welcome; they made sure I had water to drink and a hymn book to sing from and that I was able to join them in communion. I was so moved by their warmth. I had been nervous coming - still affected by the memories of the hatred expressed by Christians at my first performance, and by the fact that when I was young and forced to lived as a boy it was in church, above all, that I could never ever be myself. So today brought healing for me; and a reminder, too, that change is coming in ways we could never have imagined. Not even in our wildest dreams.